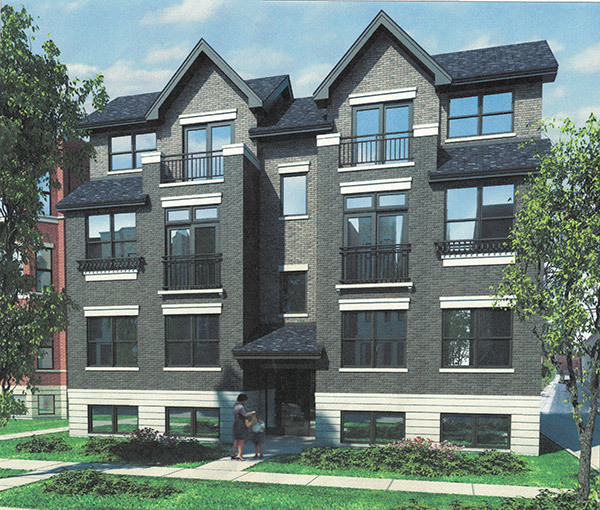 A 24-unit apartment building with several storefronts at 4346 W. Lawrence and a six-unit condominium building at 4845 N. Keystone Ave. are being proposed for the North Mayfair area. About 30 people attended an Aug. 17 community meeting which Alderman Margaret Laurino (39th) held at the Gompers Park fieldhouse, 4222 W. Foster Ave.
“(We) heard you loud and clear. The big issue is parking,” Laurino said of the proposed four-story building for the northeast corner of Lawrence and Kostner avenues. Laurino asked the developer to take another look at parking options and report back to her office. Project officials said that there may be opportunities to lease spaces at nearby parking lots which the business or organization using the lot is only there for part of the day. Plans call for three one-bedroom-units, 15 two-bedroom units and six three-bedroom units along with about 6,200 square feet of commercial space on the ground floor. A rear, one-story garage would have 27 parking spaces. One resident said that more parking is needed to accommodate the business which would operated on the ground floor. He said that customers would want free parking and would be reluctant to use the metered parking on Lawrence. The 52.5-foot-tall mixed-use structure would be constructed on the site of a parking lot, where the North Mayfair Improvement Association will hold a music festival over Labor Day weekend, and an adjacent building which was once home to a wholesale-import business. Plans call for the building to be demolished. The project required the property to be rezoned from B3-1 to the less restrictive B3-3. Also at the meeting, no objections were raised about a plan to build a 3 ½-story building at 4845 N. Keystone Ave., where a vacant house would be demolished. A multi-family building is located immediately to the north and a shopping center to the south. The two first-floor condominiums would include a basement and could accommodate up to four bedrooms, while the second-floor units would be two-bedroom units and the top floor units would be two-bedroom units. The asking price for the units would range from $350,000 to $450,000, according to project officials. A rear parking garage would have six spaces, and there may be room for two outdoor parking spaces along the south side of the property, according to a project representative. Plans call for the site to be rezoned from RS-3 to the less restrictive RT-4.5. A Keystone resident said that the property is an eyesore and that the project would be an improvement for the area.